Are you ready for the parades and fireworks? Get in the 4th of July mood with our fun new word scramble. It’s not too tough, but if you get stumped, scroll to the comments below for the answers. 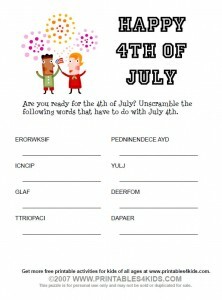 Click on the image above to view and print the July 4th Word Scramble full size or download 4th of July Word Scramble as a PDF file. enjoyed the game, would like to know the correct answers.